Doctors and patients alike love the idea of treating health problems with dietary changes along with medication when it makes sense. For people with heart failure, consuming less sodium can make a big difference. For those with diabetes, eating more fiber and fewer highly processed carbs can help control blood sugar. But with many diseases, dietary modifications can only take you so far — and putting too much faith in diet at the expense of heeding your doctor’s recommended treatment plan can put your health at risk. This may be the case with gout, in particular, according to a recent study presented at the 2018 American College of Rheumatology/Association of Rheumatology Health Professionals (ACR/ARHP) Annual Meeting in Chicago. Researchers, including those from our nonprofit organization, the Global Healthy Living Foundation, surveyed 178 people with gout about their knowledge of the condition. Of those, 53 percent were male. The average age of people in the survey was 52. 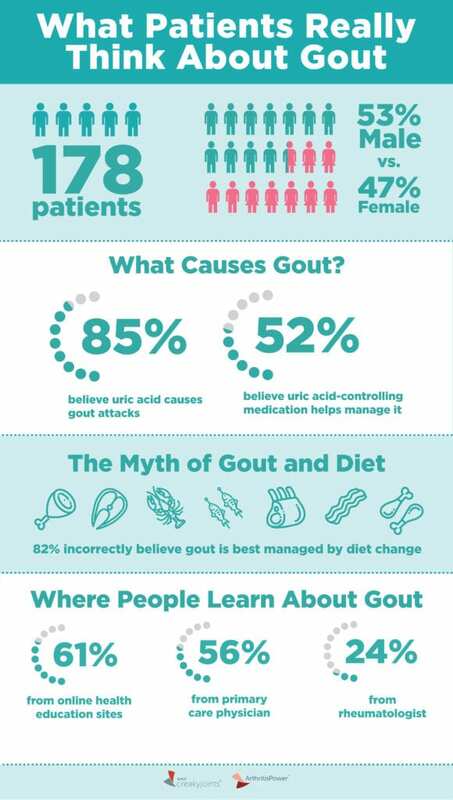 The good news is that 85 percent of people in the survey correctly knew that high levels of uric acid cause gout attacks. But only about half of people said they believe that uric acid-controlling medication such as allopurinol manages gout. Instead, more than 80 percent of respondents said they believed gout is best managed by diet changes, such as limiting consumption of certain foods like red meat, organ meats, and seafood. Interestingly, whether or not the patients surveyed were experiencing a gout flare affected some of their beliefs about gout management. For example, patients experiencing a gout flare at the time of the survey were more likely to believe gout is best managed with corticosteroids than those not experiencing a flare. Corticosteroids can effectively and quickly reduce inflammation in a gout attack, but they should not be used as a long-term treatment because of the risk of side effects. People who believe gout is best managed with corticosteroids may not be aware of the importance of taking uric acid-lowering medication on an ongoing basis. People with gout may first seek treatment from a primary care doctor, but hard-to-treat, or refractory, cases likely need to be seen by a rheumatologist. However, the participants surveyed sought information about gout from their rheumatologist (24 percent) at a much lower rate than from online health education sites and their primary care physician (61% and 56%, respectively). Men were more likely to seek gout information from their rheumatologist than were women (33 percent vs 15 percent). “While many patients prefer to access information online, there is still an underutilization of rheumatologists for information about managing gout,” says Gavigan. If you are diagnosed with RA or another musculoskeletal health condition, we encourage you to participate in future studies by joining CreakyJoints’ patient research registry, ArthritisPower. ArthritisPower is the first ever patient-led, patient-centered research registry for joint, bone and inflammatory skin conditions.